Iam back in action after a small lull :) How are you all doing? Hope Deepavali and Halloween went well. Our past couple of weeks were spent in my native town of Kannur. I got to meet my grandparents and all relatives after six long years. Meghna enjoyed her visit to the local places and loved meeting her big grandmothers and little grandparents - my father is her 'grandpa',his mom is her 'BIG grandma' and his younger brothers and wives are her 'little grandpa and grandma' :) Ofcourse, my husband was not part of this group - are there any husbands out there who love visiting their wive's side? - mine used his 'free time' to visit his own parents. O.k, chit chat apart, I did manage a little bit of work on the bed linen during the past few days.This time, the filling is done with chain stitch. Chain stitch filling is a speciality of Kashmiri Kashida. 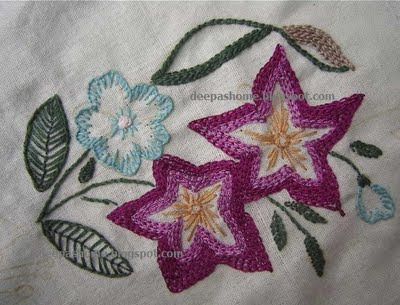 Kashmir work uses stitches such as Chain, fly stitch, feather stitch, fern stitch, satin etc. The point to be noted about this type of embroidery is that it uses only one or two type of stitches in a piece , not all together. For instance, the whole embroidery could be done with chain stitch alone. This block is not pure Kashmiri Kashida, but is inspired from the same. The leaves are all filled with fly stitch except the largest one. The work looks easy, after all its chain stitch, right? But, I had a tough time with the silk strands getting all tangled up. 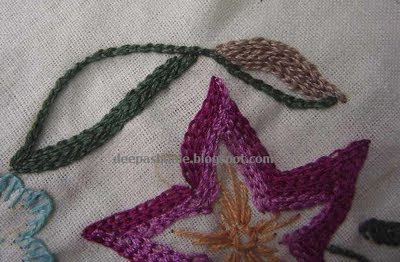 Kashmiri chain stitch is usually done with the Tambour needle. I used the standard ones. The blue flower is blanket stitched and the center is Moggakuttu -a combination of fly stitch and detached chain. Here's the big leaf again...chain stitched with two colors. I've started another block - its a little different from the usual. Will show you what it is all about in the coming post. The good thing about such a varied pattern is that I do not get bored . My mind is constantly on the look out for new stitches which I can add on to the piece. How about you ? What do you do if constantly repeating a pattern bores you? I must say, I've huge admiration for those who embroider the 6 meter long saris and manage to finish it promptly. 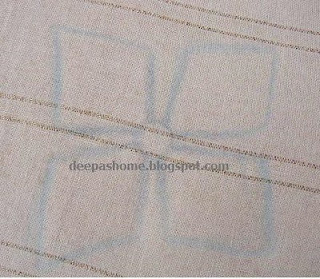 You re very good in drawing image etc..is tat a pen or pencil or something else to transfer the motif onto the cloth?? Thanks.I've used yellow carbon paper to transfer the motif. Deepa... this is lovely, I love your colour choice... from a distance, this reminds me of Jacobean work a little... very nice indeed. I get bored working on the same thing constantly, so I could never ever do a sari,or anything larger than a small block, VBG! You should give CQ a go.... get to do lots of little snippets of embroidery without it getting too big. Hi, Deepa.. Very nice work and I sure like the colors you choose,the dark fushia and the light one are my favorite colors.You do beautiful work. Hi Deepa...its very amazing to see your designs and colours that u have created ...I have a small doubt , could you pls tell me how kashuti net should be fixed in a saree for doing embroidery ..If possible could you pls show me in video so that it will be very useful for me as im new to the embroidery works. Hi Deepa..its very amazing to see your work..especially the colours you choose to fill it..Good Work!! I think it'll give you the information you need. I love your blogs very mcuh.In one blog i saw ,you tried Chikan work. Pls let me know how you did that work.